Having seen the Steve Weber designed compact transceivers on the web and having seen an MTR owned by VK1FB, I was delighted to find one for sale on vkclassifieds.net.au recently. After duly receiving it and waiting for my birthday to pass (due to my wife’s insistence on waiting for the actual day to receive gifts), I wanted to test it from home and learn the menu system, which like the radio itself, is very compact. Then in the headphones I heard “cq sota de vk5cz” which was Ian at summit vk5/ne-095 in the north east of South Australia. I listened to his contact with VK3PF and then heard him ask QRZ? (“who is calling”, or “is there anyone else there?”) to which I responded with my callsign. He replied immediately with a good signal report. I gave him a report and then told him this was my first contact with the MTR3B. He acknowledged that and wished me good luck. I returned the greetings and signed off. Yes the new radio works despite being smaller than my morse paddle. It’s the blue box in this pic. Produces about 3-5 watts on 7, 10 and 14 MHz amateur bands. The Mountain Topper Radio 3B. Ian/Buhd vk5cz posted to facebook a comment that this contact was the highlight of the activation, which was great to read. And later he also published a video clip in which the contact can be heard taking place. A day later I had the MTR connected again, this time on 14060. I tuned it up to 14062 and there was a familiar callsign, VK5CZ, in contact with someone. Looking at SOTAWATCH.ORG I saw that Ian had recently called CQ from another SOTA summit. I waited until the contact was finished, then heard him send QRZ? and again sent my callsign. Back he came with a 559 with QSB (fading) report, which was pretty good. I told him it was the MTR again, which he was pleased to hear about. Now I need a contact on the remaining band provided by the MTR, 10 MHz, for which I need to make some alternative arrangements as my home antenna does not have a suitable impedance on that band. The MTR is designed for a 50 ohm non-reactive load. 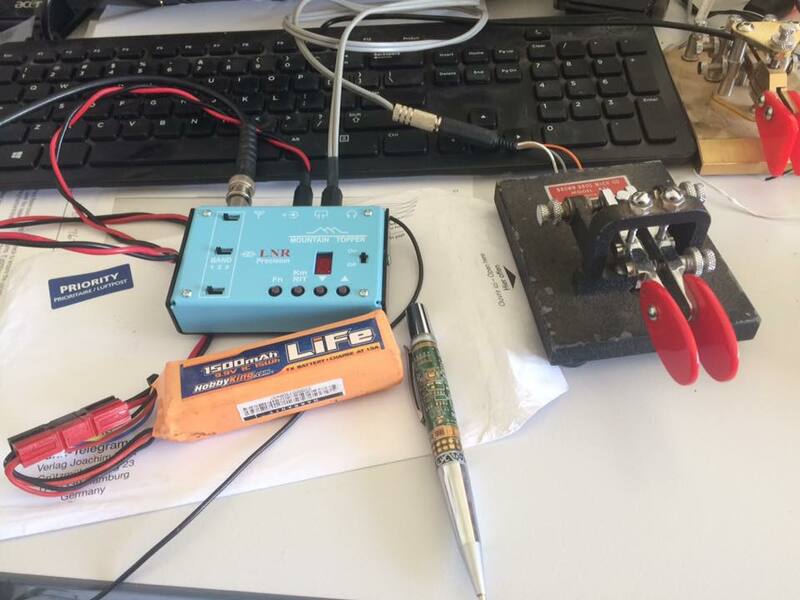 I will route it through an antenna matchbox which can be adjusted to present a 50 ohm impedance to the transmitter. So far so good. I am very impressed by the MTR and look forward to many lightweight activations with it. After getting my FT817 final stage replaced, and all power settings reset to meet spec, I started to use the radio again and quickly realised that all the memory settings (frequency and mode) had been wiped. This made it necessary to change bands using the band switch (!) and manually change between SSB and CW mode, or occasionally FM, dialing up and down the band as necessary. With the frequency settings in memories, I only needed to move between memory channels to go from SSB on 7090 to CW on 7032, for example. And on higher bands, I had several beacon frequencies stored in some memories, allowing me to quickly move between the various 10m and 6m beacon frequencies to get a quick impression of band conditions. So today I dug out the details of the FT817 memory manager software, retrieved the file of frequency settings stored on the computer, added a few new ones and saved the lot in the 817. Then repeated the process for my second FT817. So they now have an identical set of frequencies in their memories. Makes them somewhat interchangeable. All the second radio is missing is a cw filter. I have plans to sort that out soon. The details of the memory manager and how to interface it with the radio from a windows box are all in a previous post to this blog. I actually read the post to remind myself of how it worked! The previous post on this topic is here. The blog documents it all. Some readers will recognise these symptoms as those of angina, a sign that the heart does to have enough oxygen from its blood supply to continue to work at the rate required by your current exertion level. Angina is typically described as squeezing, pressure, heaviness, tightness or pain in your chest. Notice there is no mention of a sharp pain you would associate immediately with your heart. Why not? The reason is apparently that the heart does not have its own nerves like other organs. So when your brain registers there is something going wrong in your heart it tells you that some other organ is under stress. It is usually caused by blockages in the arteries servicing the heart (as distinct from the arteries the heart pumps blood into for circulation to the rest of your body). These coronal arteries are crucial for continued operation of your heart. In my case, I experienced the tightness in my chest as I walked back to my accommodation in Canberra on 20th April. I didn’t recognise the tightness as angina and all I did was stop walking and wait for the discomfort to dissipate, which it did. But on reaching my daughter’s place, I made an appointment with the doctor for later that morning, then went to work. What should I have done? I should have stopped walking right then and called an ambulance. If you ever get that tightness in the chest, or any of those symptoms listed above, go as quickly as possible to the nearest emergency department of a hospital. Or the next best thing if you don’t have access to a hospital. The doctor diagnosed it as angina and prescribed a pain reduction spray (nitro glycerine) with instructions on what to do if the pain returned. Basically, use the spray as temporary relief but get to a hospital. Within a half hour of seeing the doctor I had more discomfort and I went to the hospital for treatment. After numerous tests an angiogram was carried out and I was told then that I would have to have a triple bypass operation. All of that happened as scheduled on 3rd May and I am now recuperating from the operation. I am basically OK but a bit weak and have to steadily regain my strength. It is a very invasive operation but fortunately it is performed quite often and is well proven. The reason I am sharing all these details is to alert you to this problem. My blood pressure has been in an acceptable range (roughly 125/70) for the last 10 years. My cholesterol readings have been just inside the “safe” range. Yet neither of those indicators predicted this problem was looming for me. If I had been out in th bush needing to walk an hour to even return to my car, who knows what the outcome could have been. But it is quite possible I would not be here to tell you about it. I want to achieve a lot of things in the next 20 years and I now have a chance to do that, thanks to modern medical science.